Natalie received her Bachelors of Arts degree in Psychology from the University of Washington (UW) in 2007. She then immediately continued with her education at UW, and received her Doctorate of Physical Therapy degree in 2010. Upon graduation she began practicing in an outpatient orthopedic and sports clinic, which allowed her to work with a wide variety of patients and musculoskeletal conditions. She joined MTI Physical Therapy in 2017 and has been pursuing further training through the Ola Grimsby Institute. She has received her specialization in orthopedic manual therapy and is currently enrolled in the fellowship program. 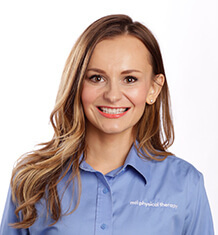 Natalie chose physical therapy as her profession due to her desire to help others and her strong interest in medicine. While working as an aide at the University of Washington Medical Center, she felt that the physical therapy field was the best fit for her and would bring her the most joy. She values the role of patient education in her treatment approach and is excited to help people lead a healthy lifestyle. Natalie believes in the importance of building relationships with her patients in order to work as a team in helping them reach their goals. In her free time, Natalie enjoys reading, traveling, exercising and hiking. She is passionate about learning as well as seeking out new experiences.